What motivated you to take up the science stream? Was it something you always wanted to do? Yes. I was always inclined to do something that would help people by improving human health. I knew it would give me a sense of satisfaction and hence I was very much inclined towards medicine and biological sciences. Medicine was always my first choice as it would mean communicating directly with people/patients. However, it was actually my neighbor who inspired and motivated me to take up research. There was a time when I would think that while doctors' do a great job diagnosing and treating people, it is actually the researchers who do all the groundwork. Scientists spend their time focusing on investigating the problem and finding a drug that would help treat diseases prior to the doctors who prescribe it in the clinics. And that to me was extremely fascinating. Can you elaborate on why you steered away from medicine and toward research? We researchers study the basis of any problem/disease/disorder in dept. We then translate it and pass on the information to pharma companies to carry out clinical trials and develop drugs. These drugs are then prescribed by doctors in the clinic. So the fact being responsible to carry out the base work is extremely fascinating to me. Can you briefly discuss what you do for work and some interesting research activities you conducted? Currently, I am looking at biomarkers for Alzheimer's disease. This disease is diagnosed, by brain MRI, very late in life and at that point it's too late to reverse the disorder and give treatment. My research is focused on identifying some proteins in the blood very early in life which would tell us that the person would be at a risk of developing Alzheimer's disease. Can you recall any eureka moments in your career? I think a eureka moment for me was when I received the excellence in research award with an audience of 3000 people. Can you briefly detail the research you won an award for? I won an award for my research during PhD. It was based on studying the molecular functions of genes involved in the circadian clock mechanisms. Can you also discuss what research you are currently conducting? Yes, I have mentored many PhD as well as undergraduate students. 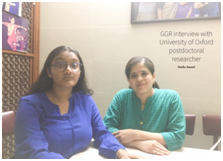 I also take on school students (age 13-15) who are interested in pursuing science/research and let them shadow my work for a few days to let them have a feel for the research field. Yes. In my experience I have always felt STEM girls are much more focused, diligent, perfectionists and have a tremendous eye for detail. I often say to my students, science and rather research is great! Don't be afraid of research. Although it is an unconventional career choice to be a scientist, if you are able to find a cure for a deadly disease the feeling you will get is unbeatable! Follow your heart and your dreams. Leave behind the peer pressure. Do something new and innovative. Even today, students in India are focused on engineering and medicine and it is quite frustrating to see them aiming for these two mainstream careers. I keep telling the new generation, be unconventional and think out of the box. There are a whole new load of career options. Choose a career in which you are interested in, work hard and you will be unstoppable.